1/52: Spacious beach front deck on the shores of the Caribbean. 2/52: One of West Bay`s premier beach front villas. 4/52: Open plan living with dining and kitchen all in one space. 8/52: St Mac`s Villa on West Bay Beach. 9/52: Another stunning view from our deck. 10/52: The dock in front of West Bay Village, a popular spot for fishermen to hang out. 11/52: Private beach garden for guests of St Mac`s Villa only. 12/52: The garden is shaded by mature coconut palms. 14/52: View from the dock in front of West Bay Village. 18/52: Living area with vaulted ceilings and lots of natural light. 24/52: Views of the Carribean from your sofa. 25/52: West Bay Village from the dock. 28/52: Large kitchen great for entertaining. 35/52: Master bedroom with beach front deck. 39/52: Master bathroom with tub / shower combo and private deck. 41/52: Our beach. West Bay. 48/52: Guest twin room set up as a king. 49/52: Guest twins set up as king bed. A new king bed, new living room couches, chairs, tables, and bar stools. These items are so new we don't even have any photos yet! Look No Further! Why be steps or minutes from the beach when you can be right on the sand? St. Mac's is a traditional stand alone Caribbean style villa (3 bedroom unit upstairs, two apartments with 1 bedroom each downstairs) with loads of charm and a spacious, open floor plan. The well equipped gourmet kitchen features granite counters, stainless appliances, microwave and dishwasher. All the modern equipment and conveniences, plus an incredible ocean sound track. Cooking with a View! A large dining table area off the kitchen will be a perfect place to serve your fresh local fish, and a guest bath completes the space. Outside, your private beachfront garden awaits, lined with palm trees and lounge chairs. Float, swim and snorkel to your heart's content in the clear, warm waters in your front yard. One of Roatan's finest technicolour snorkeling experiences is located just steps away! Let the sound of waves lull you to sleep in the large king master bedroom, with sliding doors opening onto the large veranda with ocean view. Soft pillows and nice sheets add to the total sleeping experience. The master bath has twin sinks and a shower/tub, as well as another deck off the back with door to provide cross ventilation. One guest bedroom has a King size bed and a lovely wraparound veranda off the back. Fish themed bedroom three features two twin beds (can be set up as a king) with thick mattress pads, a large veranda, and a Jack-and-Jill bathroom with twin sinks shared with the other guest bedroom. The upper unit's light and airy open living area has floor to ceiling windows, vaulted ceilings and expansive wrap around views of the glorious Caribbean. Enjoy dining al fresco on the beachfront covered veranda with the waves as your soundtrack. Lounge the day away reading in your twin hammocks, watch the boats come in, or if you feel like it, do a cannonball off the dock to the left of the villa. All your favorite TV channels are available for your viewing pleasure on our new 50' flat screen TV, as well as a DVD and CD player. Wifi is available at no charge throughout St. Mac's. There is also a separate area with an overstuffed reading chair and a computer work table area should you need to check in with the world. All rooms have ceiling fans as well as central air conditioning, but you will find the gentle Caribbean trade winds will keep you cool as well. 24 hr Security is on the grounds, a full time landscaper and twice weekly housekeeping service is also included. Provisions can be purchased down the street at the local deli at West Bay Mall (not really a 'Mall'! ), and there is good local food, a popular coffee shop as well as other small shops. Many other dining options are also steps away, and numerous great dive shops are located nearby (we like Bananarama). Don't miss the weekly visits of the man selling fresh local seafood when he comes to St. Mac's! The villa is located right next door to Infinity Bay condominiums, with popular outdoor sports bar and restaurant. Taxi boats can take you from the public dock right out front to funky West End with its happening nightlife, taxis are readily available to drive you back. Enjoy world class snorkeling and diving just a short stroll down the beach! St. Mac's is the beachfront part of West Bay Village, a small private enclave of Caribbean style homes that have retained their traditional Caribbean character in a concrete condo world. If you are looking for charm and true beachfront, Look No Further! Large group? St. Mac`s Beach Apartment has 1 bedroom and 1 bathroom, and the Garden Apartment has 1 bedroom and 1 bathroom. Rent the whole house for a total of 5 bedrooms and 4 bathrooms, sleeping up to 10 persons. Enquire for availability & pricing. Staff was excellent to work with. Every question and request handled promptly with professionalism and knowledge. The security guard made us feel safe and always very friendly and willing to give us a helping hand when necessary. All the staff were absolutely wonderful to work with. REPLY: Thank you very much! Great staff, from garner, to security staff, specially Jose, to office staff. The only reason why I wouldn't rent the property again is only because it does not have a backup generator. We experienced 4 power outages in 7 days, lasting for hours, and with the humidity and mosquito and flies problem, it is impossible to keep doors open. Having to sleep with no A/C within those conditions was almost unbearable. REPLY: Thank you for taking the time to review your stay. We are very sorry for the power issues, that was certainly an exceptional week with regards to the electric company's service. Hopefully it hasn't tainted your view and you will come back to see us. The staff members in the villas are excelent!!! From security, maintenance and cleaning the service is outstanding. Ive been to Roatan 9 times... This is the 4th time I stay here!!! I love it and I will stay here always!!! Best place to stay in West Bay far....!!!! RESPONSE: We love having you and look forward to your next visit! Very helpful, friendly and for the most part quick to respond. Mentioned above - really the only challenge we had was the water pressure, and especially in the master bath shower. REPLY: We appreciate your review, thank you. Yes, we had definite issues with the water pressure during your stay, very sorry about that. We've solved the issue so it should not happen again. Ruth and Ernest were always very responsive. Marty and his Team were fantastic getting us to where we needed to go. This is our third stay A St. Macs Upper. I honestly think that this is the best rental property in West Bay. Your views are incredible with your private beach area. The open structure of the house combines the dining, kitchen and living area into one great great room with two double sliding doors that provide access to a huge deck overlooking the beach and the beautiful Caribbean. We are definitely going back. Everyone was kind and helpful. Brad went out of his way to assist us with our internet issues and ensured they were remedied promptly. He was also very helpful referring us to the pharmacy during an illness. This is our second time to St. Macs - last time was three years ago. We noticed that the maintenance guy was not raking the sand daily like before, and the palm trees really need trimmed (blocking view) and the coconuts need to be removed. The property continues to show signs of age and is in need of some TLC inside. Items such as bathroom remodels, curtain rod repair/replacement, back bedroom bedding replacement, etc. would really go a long way towards enjoyment of the property. REPLY: Thank you for your honest assessment. We have passed your review on to the owners and I am sure they will address these issues when they vacation with us in December. The staff was very professional, knowledgeable, helpful and courteous. I just wish they could have gotten the water pressure in the master bath shower fixed, but I survived!! REPLY: Thank you so much for your patience with the water pressure. The workers from the water company finally found the problem and corrected the issue. We really liked the house. It was very clean, spacious, had everything we would have had at home. The house was perfectly situated between the snorkeling area and everything else. It was nice being next door to Infinity Bay and their breakfast buffet. The security personnel were excellent. We felt very safe. We also became friends with some of the vendors. They offered their services but when told no or not now they were not pushy. Overall it was a wonderful experience!!!! Everyone who worked at the property management was amazing and helped with anything we needed. Thank you guys for a wonderful time. You made it so easy and comfortable! Everyone stops and stares! I'm telling you the truth. Everyone who walks down the beach stops and looks at this house! They are thinking, "Why didn't we know about this place?" All I can say is I'm glad I found it on tripadvisor! From the moment we arrived at the airport they had someone to help us with our bags, the driver Marty was amazing and stopped at the grocery store on the way for us. What can I say about the house? All you have to do is look at the pictures. The view is amazing! We had a 2 year old, a 3 year old and a 5 year old, the porch out front is open railing. It makes for a better view, but I was a little nervous with the kids. They did fine, though. If we ever go back which I hope we do, I wouldn't want to stay anywhere else. This house is a quiet, beautiful sanctuary on West Bay. So different from all the other condos and beach cabins. This is a true beach house. Nothing to compare to it really. St Mac's upper Another great stay at St Mac's upper. I highly recommend for a larger group since it has 3 bedrooms. The front deck is fantastic and the kitchen is very nice. Bedrooms large. Overall I think it's one of the best on West Bay. Watching the world go by! St. Mac's Upper Beach house is the perfect place to kick back, enjoy the beach, people watch and snorkel just a 2 minute walk away. 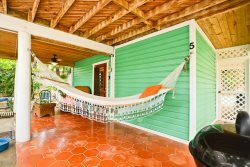 The house is spacious and the upper deck with the 2 hammocks make you feel you never leave the beach. There is enough space to enjoy both family and friends while letting you have personal quiet time. Well stocked kitchen, spacious bedrooms each with a private deck if you need alone time. Literally 100 steps to the beach to beach chairs or to your nice shaded yard with chairs to watch the world go by. Many people return year after year to West Bay so are friendly and gather on the dock each night to toast another day and the setting of the sun. There is a group that walk every morning to do hill walks as well as beach walks. Has a community feel to the place indeed . There is a security guard 24 hours a day to assist you if needed. The Honduran people are very respectful of your private space so will not come on the property without an invitation to sell you anything. All the beach services are literally in front of you so you can take part or just find a chair and relax. A five minute walk back of the property is a lovely Java House and LALa's for breakfast, lunch or dinner. Within 2 minutes on the beach side you will find places to catch a drink or a snack. The snorkelling is fantastic and St. Mac's is right there! No need for longgg walks or water taxis to get to the snorkelling. We did mention to the rental agency about possibly upgrading the dishwasher and fridge but they are aware of these concerns. It was wonderful of the rental agency to ask us questions about likes and dislikes. St. Mac's is a gem for a great getaway! The concierge, Junior, is awesome! He's friendly, knowledgeable and ready to help out in any way possible to make sure your trip is only the best. Halfway through our vacation we were loving it so much, we booked for the following year at St. Mac's Upper Level. We can't wait to get back there! Thank you to St. Mac's and Island House Roatan for an amazing trip! AMAZING! Already booked to return. We didn't know what to expect when we arrived on Roatan. We further didn't know what to expect of the house. What we found was a gorgeous beach house that literally sat on the sands of the beach with the calm, blue waters of the ocean right in front. The house was clean, modern, and absolutely charming. We spent a lot of time sitting on the deck that overlooked the beach - sleeping in the hammocks, reading under the ceiling fans that provided a cool breeze, or eating our meals at the table. The beach is lined with fun activities, bars, and restaurants. Dive shops are scattered around and easily accessible for incredible dives all day long. Or you can just walk into the water, swim out a little bit, and be in perfect snorkeling spots. The house was located in a little beach village called West Bay Village. A security guard stood at the beach entrance 24/7 and a closed gate was located on the back end. The village was well kept. Island House Roatan, the vacation rental agency, was very helpful and on hand at any time during the day. We loved our stay in St. Mac's, both the front downstairs apartment and especially the upper apartment. Both were well appointed and comfortable. The beach and grounds were immaculate! The only way for my vacation to be improved is for me to have stayed longer. Truly did not want to leave. Cannot wait to come back. Thank you for a wonderful stay! Air Conditioning is available at $35/day (4 units in apartment).